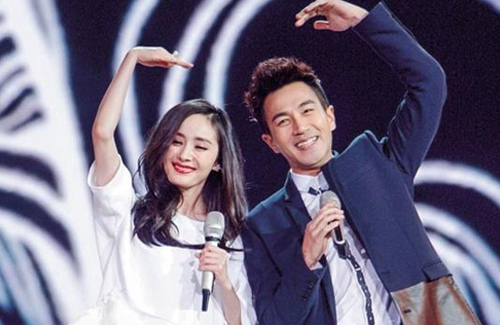 While attending a press conference to promote his upcoming drama, Hawick Lau’s (劉愷威) demeanor fueled gossip that his marriage was falling apart with 29-year-old actress Yang Mi (杨幂). In their two-year marriage, Hawick and Yang Mi were often plagued by divorce rumors. Hawick said, “In the past, I didn’t arrange my work schedule that well, sometimes even having two dramas film concurrently together. From now on, I will arrange my time better. I will reduce my work load this year, to spend more time with my family.” While Hawick admitted that they are often separated due to filming commitments, he assured that their marriage is going well. Yang Mi has also issued a press statement refuting the divorce rumors, stating they were “completely fabricated and malicious”. Their daughter is still young.. should spend more time with her as before they know it, she’ll be all grown up. Time flies and they will miss watching her grow up because they are too busy with work. Wishing them the best. Look like a solid couple though. @happybi agreed, they seem still pretty solid. be pretty sad if their marriage doesnt even pass the 5 year mark because in the long run, the kid suffers the most. @akinu with long work hours and separated frequently, it’s easy for couples to drift apart. @janet72 while i agree, i still feel it’s a shame that people nowadays just give up so easily in marriage. No smoke without fire – while some rumours are thrash, quite a number has been found to be true. I think it is likely. The article above is actually “old news”. The latest news is that the divorce rumor was actually deliberately started by someone on weibo (supposedly an industry person whom both Hawick and Yang Mi knew) — the person (a female) posted a few days ago that she had personal knowledge of the couple’s divorce. She claimed that Yang Mi was cheating on Hawick with some other artist (presumably someone she had filmed a series with) so Hawick got pissed and divorced her, explaining why he answered the way he did at that event. The person also said some bad stuff about Yang Mi in her post and made all sorts of claims about Yangi’s relationship with Hawick and his family. To clear their names, Hawick and Yang Mi issued a joint statement through their management company a few days ago refuting the person’s claims and also threatened legal action against the person for slander. The person then issued a public apology saying that she actually had no inside knowledge at all and had fabricated the divorce story. She also deleted all of the posts related to the issue from her weibo and asked people to stop re-posting the false story (though of course by then, it was already too late, as the story had already spread like wildfire). I don’t follow either artist and neither like nor dislike either one, but I do kind of feel sorry for this couple, as there are obviously people out there with malicious intent and who don’t want to see them do well. Seems to me that the two of them (especially Yang Mi) are always targeted with negative rumors and news for some reason.. Sure, people have the right to hate certain celebrities for their own reasons, but to deliberately make up stories about those celebrities and take advantage of social media to feed the rumor mill is just plain wrong. Even though it might very well be that Hawick and Yang Mi are possibly having some issues with their relationship/marriage, doesn’t mean it’s ok to make up divorce rumors and spread them around with the intent of making their lives miserable. What that person did was deplorable and I hope Hawick and Yang Mi do move forward with legal action in this instance! @llwy12 What a complex world? That is an extremely toxic action – can be defamation any day if able to show that she was the one responsible. May even be a criminal offence.